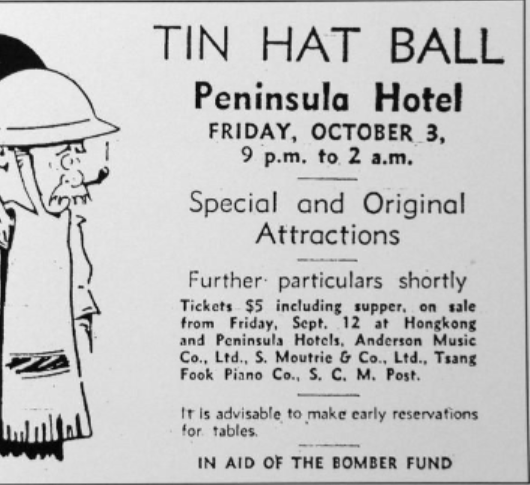 Just over a day earlier, on Saturday night, another ‘Tin Hat Ball’ was put on at Hong Kong’s Peninsula Hotel to raise funds to help poor war-battered Britain build the aircraft it needed to defeat Nazi Germany. As a war-free colony, it was felt that it was the least they could do for old Blighty. A $5HKD ticket would include supper and dancing until 2am. This time (on December 6 – not as dated on the poster below), the Governor of Hong Kong would be there, as would Mme Sun Yat-sen. The orchestra played The Best Things in Life are Free, young ladies waltzed wildly, and each ball gown’s flared skirt flew out as a swinging bell. Suddenly the music stopped. A naval officer had commandeered both a megaphone and a balcony overlooking the dance floor. He announced that all naval personnel must report to their ships. War was imminent and it was felt that the safest place for warships would be at sea. There was a similar emergency plan to evacuate the warships from Pearl Harbor, but the threat was not recognised in time. At 2am (Hong Kong time) on Monday 8th December, Pearl Harbor was attacked. At 4.45am coded instructions on Tokyo radio informed listeners Japan was at war with Britain and the USA. 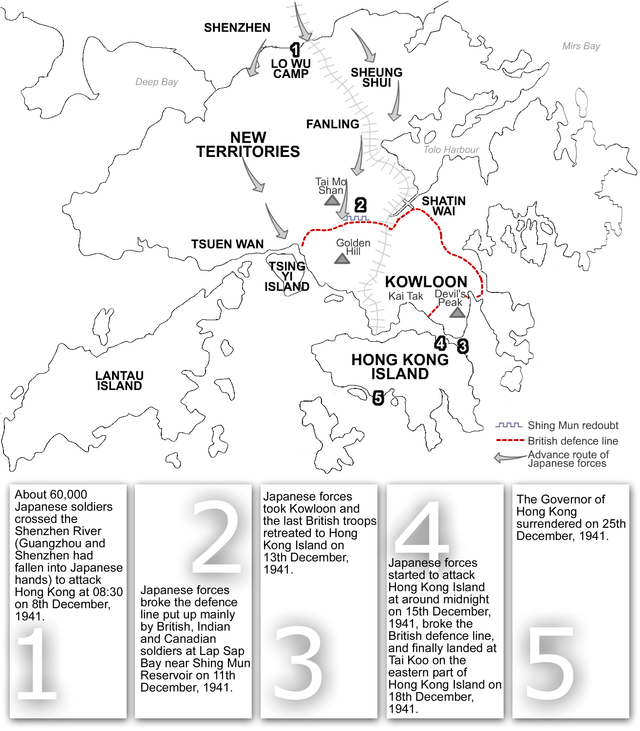 In Hong Kong, the Governor was notified and troops were told to prepare to retreat from forward positions on the border with China. Later they were told why. The city awoke to sunshine, a clarion blue sky and air raid sirens. Shortly after 8am a dozen Japanese bombers, with fighter escorts, dived bomb Kai Tak Airport in the heart of Kowloon. Lining the runway which projected into the harbour were all five military aircraft and seven civilian planes. Britain’s entire air fleet was knocked out of operation within five minutes. By comparison, the armed forces fighting the Battle of Hong Kong would last a whole lot longer. Focus on the Battle of Hong Kong at Tony Banham’s Hong Kong War Diary or Phlilp Cracknell’s Battle for Hong Kong blogspot. Search around old Hong Kong, including wartime diaries, in David Bellis’ Gwulo website. There is a Battle of Hong Kong Facebook group and a Stanley camp Yahoo group.